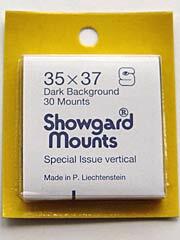 35/37mm Showgard Mounts - black backs. Brilliant Service. My thanks to all concerned. Badge arrived today and is just the job... Thanks for all your help... I've passed you details onto other veterans. Many thanks for the very prompt service you gave me. Thankyou for the ties I received. They are of excellent quality and I am very pleased with them. Huge thankyou for your response to my recent order. I was literally gob smacked to find my order in my mailbox the following morning, Well done. Much impressed by your speedy delivery, thanks. Your assistance and attention to my order has been exemplary. It has been a pleasure doing business with your company. Thankyou for the medal ribbons received this morning. I am most impressed with your excellent service. I can't believe you were able to ship the ties so quickly. They look wonderful, thanks again. Just a short note to thank you for your prompt service regards the Blazer Badge. I would like to take this opportunity to thank you very much for the speedy manner in which you conduct your business. I feel sure you will be receiving more orders from fellow members of our club when I pass the word around. Tie arrived yesterday and I'm very pleased with it. I shall wear it with pride. Fantastic service and I will use you in the future whenever possible and also recommend you to my friends. Just to say how Very impressed I am with receipt of my tie so very quickly, In this day & age truly excellent!!! Thank you for your prompt and excellent service. I will certainly recommend your website and will purchase from you again. I ordered the tie online, ...it arrived at my home here in France in a little over 2 days. Many thanks for your prompt service! Very many thanks for the delivery of the two ties this morning. I am grateful for your very prompt and efficient service. Just a note to thank you very much for your excellent service. We will certainly not hesitate to recommend you to other friends and relatives. This has to be one of the fastest delivery services in the land!! Many Thanks. My order, made yesterday, arrived this morning! That has to be the quickest delivery yet! Thank you, greatly appreciated. I have bought a few badges from your selection, all of a very high standard. The delivery time was first rate, overall an excellent service. Many thanks for a quality service and your expedience. It is very much appreciated. Regards. Thank you for my order that was received this morning, the service from you is fantastic. I ordered yesterday, I received them today - mightily impressed with your efficient service. Absolutely Superb! the clip arrived in the post this morning, excellent service thank you. Very pleased with badge and the service, would be more than pleased to deal with your company again, well done. 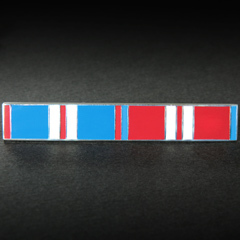 We stock an excellent range of medal ribbons, this range is for full size military medals. The ribbons are high quality and suitable as replacement ribbons for dirty or lost medal ribbons. The ribbons are provided in approx. 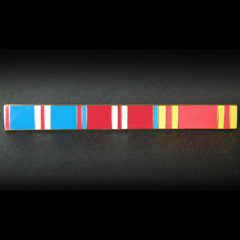 6inch (150mm) lengths, suitable for mounting medals and creating ribbon bars. 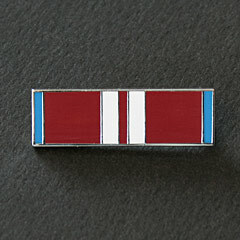 We also stock a range of Miniature Medal Ribbons. Selection of European and World Military Medal Ribbons. Iron Cross, French and Belgian Croix de Guerre etc. View our NATO and United Nations - UN Medal Ribbons, UNFICYP, UN Korea, Non Article 5, Kosovo etc. 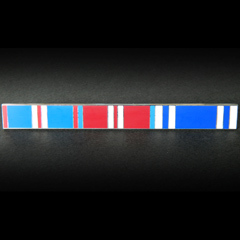 Enamelled ready to wear ribbon bar with safety pin type fastener, Fire Brigade Long Service Medal Ribbon bar. It was awarded to all ranks of local authority fire brigades for 20 years exemplary service. Enamelled ready to wear ribbon bar with safety pin type fastener, Queen Elizabeth II Golden Jubilee 2002 Medal Ribbon bar. It was awarded for 5 years service. To Armed Forces, Police, Prison, Coastguard, Fire Services, Ambulance, RNLI and Mountain Rescue. British Golden and Diamond Jubilee and Police Long Service Good Conduct, hard enamel ribbon bar. Ready to wear with safety pin style fastening. celebrating 50 and 60 years on the throne for Queen Elizabeth 2nd EIIR. 1952-2002 and 2012 along with the Police Service Long Service Good Conduct medal ribbon (for exemplary service). Enamelled ready to wear ribbon bar with safety pin type fastener, Fire Brigade Long Service Medal and Golden Jubilee 2002 Ribbon bar. Fire Brigade Medal awarded to all ranks of fire brigades for 20 years exemplary service, Golden Jubilee for 5 years up to Feb 2002. British Golden and Diamond Jubilee and Fire Brigade LSM, hard enamel ribbon bar. Ready to wear with safety pin style fastening. celebrating 50 and 60 years on the throne for Queen Elizabeth 2nd EIIR. 1952-2002 and 2012 along with the Fire Brigade Long Service Medal ribbon. 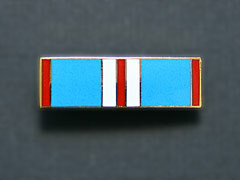 Enamelled ready to wear ribbon bar with safety pin type fastener, Police Long Service and Good Conduct Medal and Golden Jubilee 2002 Ribbon bar. Golden Jubilee awarded for 5 years service up to Feb 2002. Police LSGC awarded for 22 years full time service (20 years from 2010). 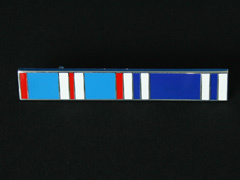 Enamelled ready to wear ribbon bar with safety pin type fastener. 2012 Queen Elizabeth II Diamond Jubilee medal ribbon bar. Awarded to those who have completed five full calendar years of service on 6 February 2012 in the Armed Forces and emergency services, and to prison service personnel. British Golden and Diamond Jubilee hard enamel ribbon bar, ready to wear with safety pin style fastening. celebrating 50 and 60 years on the throne for Queen Elizabeth 2nd EIIR. 1952-2002 and 2012. 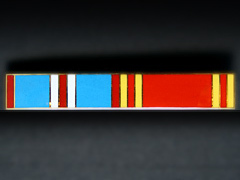 Ready prepared ribbon bar, of the OSM Afghanistan with Rosette to denote award of clasp/bar, plus Iraq 2003 Medal. Mounted onto a metal bar and ready to pin on to the tunic, this is a full sized ribbon bar with rosette on the OSM. Other Rosettes, MIDs etc are available from the Medal Accessories page. 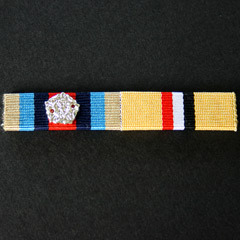 Ready prepared ribbon Buckram Bar, of the OSM Afghanistan with Rosette to denote award of clasp/bar, plus Iraq 2003 Medal. Ready to sew on to the tunic, this is a full sized ribbon bar with rosette on the OSM. Other Rosettes, MIDs etc are available from the Medal Accessories page. 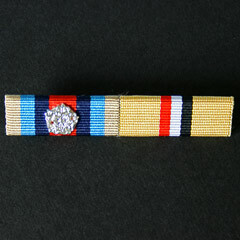 We can also provide medal ribbons, ribbon bars and replacement miniature medal ribbons, please enquire. UK Postage & Packing | Rest of the World Postage and Packing (shipping). We do not sell 'toys', our products are not suitable for children unless clearly described as such. Images are not to size, colours vary. Many products on this website are not available in the shop to buy, please phone before visiting. Collectors Centre Online, 35 St.Nicholas Cliff, Scarborough.